KATHMANDU, Jan 26: Various international non-governmental organizations (INGOs) and local NGOs involved in the reconstruction of health posts and other health institutions in the earthquake-affected districts are found constructing such structures without having their building designs approved from the government authorities. They have flouted the reconstruction guidelines even as the government has made it mandatory to have building designs approved prior to starting any kind of construction. A report prepared by the Central Level Project Implementation Unit (CLPIU) of the Ministry of Health following monitoring of 67 health posts and other health institutions either constructed or being constructed by various 10 I/NGOs in seven most-affected earthquake-hit districts shows that designs of only two health posts were found to have been approved before carrying out construction work. The unit in its report has stated in the remark section that the 'detailed design or detailed working drawing' not approved but work is ongoing for all the remaining 65 health posts that are either already constructed or are under-construction in the seven districts by various 10 I/NGOs. 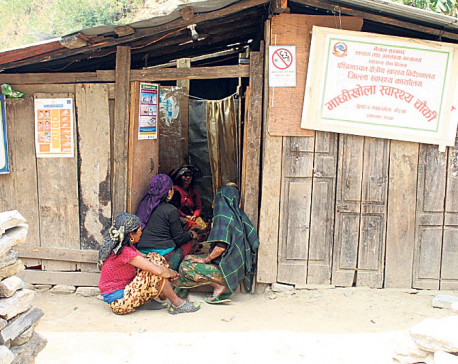 The report shows that Save the Children has constructed 18 semi-permanent structures for health posts in various villages of Gorkha, Nuwakot, Rasuwa, Dolakha, Sindhupalchok but the organization has not approved building designs of the health posts. Similarly, American Nepal Medical Foundation has constructed as many as 11 health posts in various villages of Sindhupalchowk district and reconstructed one hospital but the organization also has not secured approvals for the building designs of the structures, according to the report. Likewise, donor agency USAID is also constructing a Primary Health Care Corporation (PHCC) in Ramche of Sindhupalchok but it has also not secured approval for the structure's design. The report stated that Karuna Foundation, another NGO, is currently constructing 12 health posts and has completed construction of two health posts in villages of Raswua district but remarked that 'detailed working drawing' of the structures have yet be to be approved. Terre Des Hommes, another INGO, has also completed construction of four health posts and is currently constructing another seven health posts in Kavrepalanchowk but it has secured approvals for the building design of only one health post so far. The CLIPU also found that Sipradiyan Sahayata Sanstha, Netherlands Leprosy Relief, One Heart World-Wide, Rainbow Pokhara and NWED have also constructed or are constructing 20 health posts in Dhading, Sindhupalchowk and Gorkha but building designs of none of the health posts have been approved by the ministry. However, Rural Reconstruction Nepal has started constructing a health post in Mirge of Dolakha only after having the building design approved from the authorities. 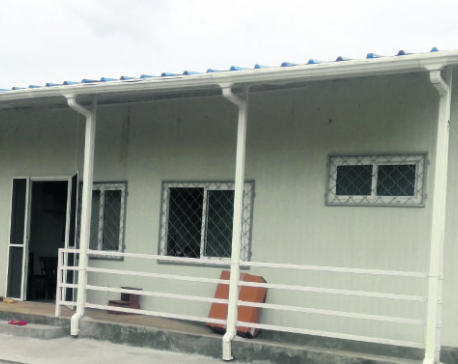 "Some I/NGOs have been found constructing health posts in various districts without securing approvals for the building designs although it is compulsory to approve building design prior to beginning any kind of building construction. We have asked them to come up with the detailed designs immediately," Ramesh Adhikari, chief of CLPIU, said, adding, the ministry will ask the I/NGOs to review their construction work if the constructed or under-construction structures do not match the building design. Ram Thapa of Karuna Foundation said that the organization is in the process of submitting to the ministry the building designs of the health posts it has constructed. "The ministry had come up with a prototype design and as we were constructing health posts in line with the design, we thought it was not necessary to submit building designs. But as the ministry has said a building design is compulsory, we have already initiated the process to submit it," he added. However, infrastructure specialist at the Save The Children Yadav Mainali said that the organization had secured approval of the building designs of the health posts before beginning the construction. "I am surprised how the name of our organization has come in the list of organizations not submitting building designs," he added.